Across the surface of Lake Ontario, the reflections of the downtown skyline in the city of Toronto, Ontario in Canada shimmer in an array of hues at dusk. The sky is highlighted in a brilliant blue color while the lights of the buildings and the waterfront illumination display the beauty of the city. The prominent feature of the skyline is the CN Tower which begins to glow as dusk settles in. Reaching a height of 1,815 feet and 5 inches, well above the rest of the buildings, the CN Tower is the second tallest building in the world and Canada's tallest National Tower. The CN Tower is one of the most popular destinations for tourists visiting the City of Toronto. Please let me show you more of my pictures from my "photo gallery: Toronto City Photos". 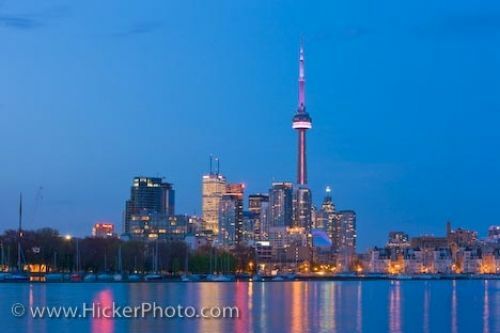 Picture of the skyline of the City of Toronto in Ontario, Canada at dusk with the reflections adorning the surface of the lake. Pictures from photo gallery "Toronto City Photos"
... the skyline is stunning as the reflections span across the stillness of the water while luxury boats moor along the waterfront waiting the onset of a new day. Skyline of Toronto City seen from Ontario Place, Toronto, Ontario, Canada at dusk.